Tony Greenstein's Blog: The Question of Zio - Is ‘Zio’ anti-Semitic or is it anti-Semitic to say ‘Zio’ is anti-Semitic? The Question of Zio - Is ‘Zio’ anti-Semitic or is it anti-Semitic to say ‘Zio’ is anti-Semitic? Words mean what I want them to mean - the only question is who's master? When the fake news story of anti-Semitism at Oxford University Labour Club broke last year, one of the main allegations was that Jewish students had been baited with chants of ‘Zio’. No proof was brought that this was true but as is so often the case, fake Zionist allegations rapidly become accepted as the truth, despite Labour’s Inquiry finding no evidence of this claim. Leaving aside that the concept of a ‘Jewish people’ is itself anti-Semitic, this ‘national identity’ was used to ban a book from Israel’s high school English syllabus because it depicted a relationship between a female Jewish teenager and a male Arab teenager. Inter-racial relationships are anathema to the Zionist concept of racial purity. 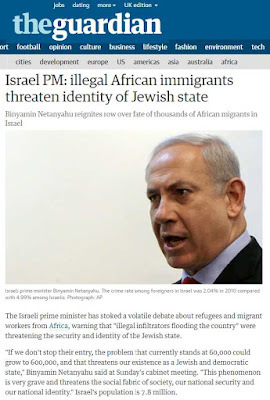 The concept of ‘Jewish national identity’ was used by Netanyahu as the reason for Israel to refuse accepting even one Syrian refugee. Their admission would dilute Israel’s Jewish majority. The quest for racial purity was the guiding principle of states like Nazi Germany. 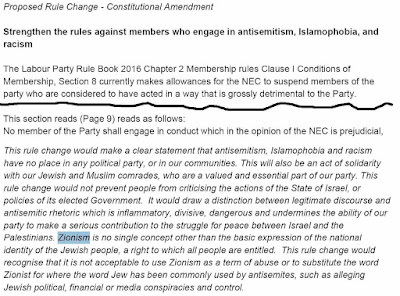 Under the guise of opposing ‘anti-Semitism’ the Jewish Labour Movement said it was not ‘acceptable to use Zionism as a term of abuse’ even though Zionism as a racist ideology is inherently abusive. 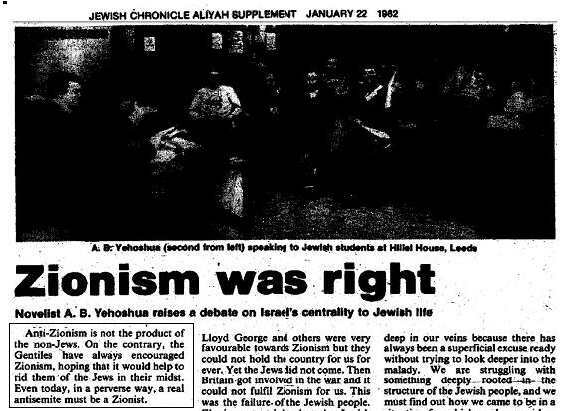 The JLM even had the audacity to protest at the substitution of ‘Zionist’ for ‘Jew’ when it is Zionists above all who conflate anti-Semitism and anti-Zionism. What then is Zionism? It was a movement for the establishment of a Jewish state in Palestine. Because another people were living there it was, by its own admission, a settler colonial movement. It sought to displace that people because they were not Jewish. It was therefore, by definition, a racist movement and in its early years openly campaigned for ‘Jewish Labour, Land and Produce’. 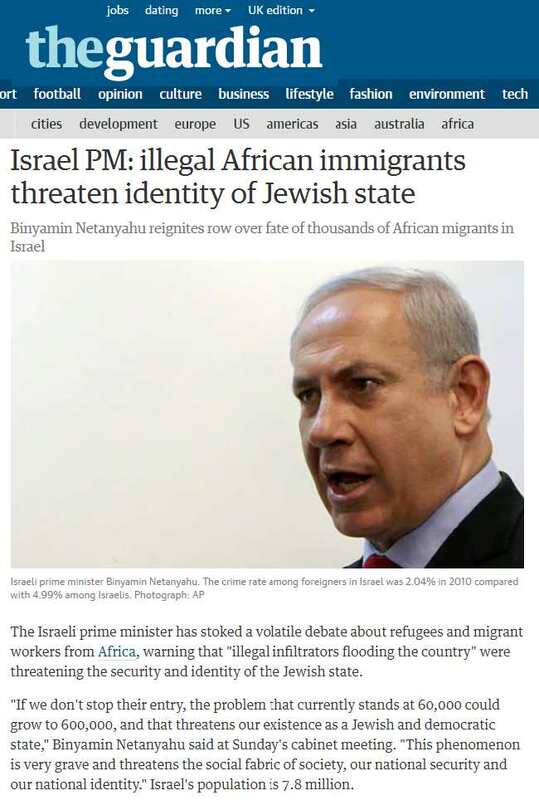 So is Zio anti-Semitic? I have to confess that before this bogus argument broke out I had never used the term ‘Zio’. It is though handy to use on Twitter for 2 reasons – first because of a 140 character limit and secondly because the racists who call themselves Zionists don’t like to be called ‘Zios’! It is perfectly acceptable to abuse racists and Zionists. Racism is by definition abusive and Zionists in particular repeatedly accuse Jewish anti-Zionists of being ‘self-haters’ (a Nazi term) or Kapos (collaborators with the Nazis) which is admittedly ironic since it was Zionism which did the collaborating! 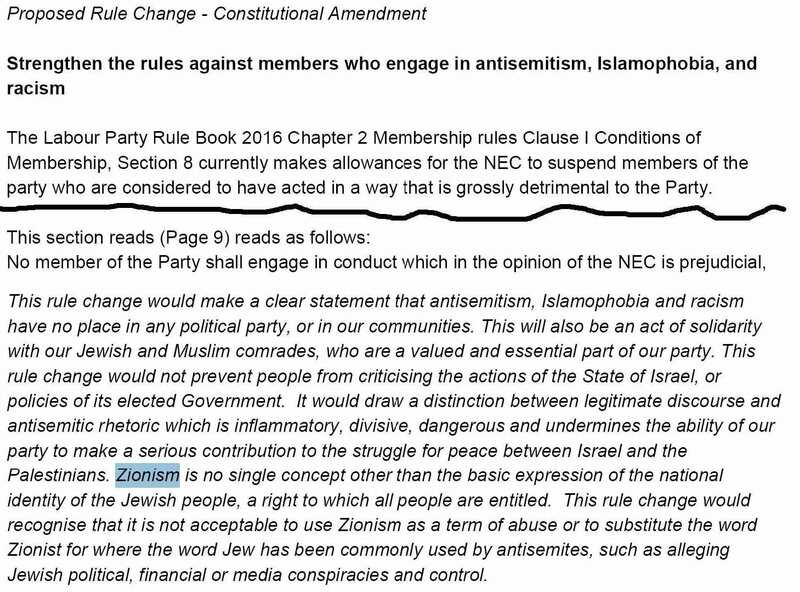 Extract from Chakrabarti's Report on the term 'Zio' - no reasons are given as to why an abbreviation of Zionism is anti-Semitic even if it is not complimentary! In her Report on Racism and Anti-Semitism, Shami Chakrabart demonstrated that she knew nothing about Zionism when describing 'Zio' as a 'racist epithet'. She gave no reason as to why this was so other than that it began as an abbreviation of 'Zionist' (a term she didn't understand). She said that noone used it to describe their own political or cultural identity. She is wrong. Zionism is used to describe the political identity of some Jews (& non-Jews). It may well be used as a term of abuse on occasions. 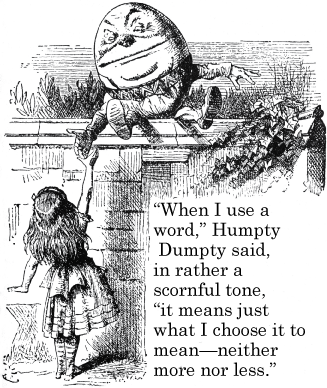 Usually it is used as a description of someone's political position. Chakrabati's Report was a mixed bag but on the question of 'Zio' she provided no reasoned argument as to why it was anti-Semitic. If it is abusive it is because Zionism is very abusive! Why is it important to defend the use of Zio? Because it is important never to let one’s enemies control political discourse. Those who define the language control the narrative. That is why something seemingly insignificant is actually very important. Zionism is racist, Zios are therefore racists, except for those few Zionists who genuinely believe that Zionism and anti-racism is compatible. Today there are very few genuine socialists who are also Zionists. It is no accident that the Jewish Labour Movement in last year’s Labour Party leadership elections voted by 92% to 4% to support Owen Smith against Jeremy Corbyn. The Jewish Labour Movement is an appendage of the Right in the Labour Party. In Brighton and Hove, the Jewish Labour Movement provided 5 delegates, as an affiliated socialist society, in each of the 3 constituencies to the Right (& they still lost!). Labour Zionists today are at one with New Labour. For example its Southern Regional Organiser is Ivor Caplin, ex-MP for Hove and former Junior Defence Minister under Blair at the time of the Iraq War. In other words a paid up war criminal. As to Zio it is short for Zionist. Even the Zios agree on that! Zionism is a political ideology which believed that the Jewish Question as it was called could be solved by the ‘normalisation’ of Jewish people, i.e. they had to form a nation state. Those who believed the Jews should ‘return’ to Palestine were originally primarily non-Jewish anti-Semites. People like Arthur James Balfour who in 1917 signed the famous Balfour Declaration promising the land of the Palestinians to the Zionists. In 1905, as Prime Minister, he introduced the Aliens Act into the House of Commons whose aim was to keep Jewish refugees from the Czarist pogroms out of this country. He didn’t like Jews but was all the more happy to send them to Palestine. Anti-Zionism is not the product of the non-Jews. On the contrary, the Gentiles have always encouraged Zionism, hoping that it would help to rid them of the Jews in their midst. Even today, in a perverse way, a real antisemite must be a Zionist. Given that many Jews are non-Zionists or anti-Zionists and many non-Jews are Zionists how can it be anti-Semitic to use the term Zio? Indeed the biggest Zionist organisation in the United States is the million strong Christians United for Israel, led by the anti-Semitic Pastor John Hagee who believes that Hitler was an agent of god sent to drive the Jews to Palestine. Many millions of people – from Blairites to Christian fundamentalism are Zionists. The first Zionists were Christian not Jewish. So those who say that Zio is anti-Semitic are really saying that all Jews are Zionists and that all Zionists are Jews. Which is an anti-Semitic statement because it implies a uniformity of political opinion to all Jews. So if anyone takes exception to the use of ‘Zio’ you should tell them to stop being anti-Semitic!